When chatting with Tony Baumann he is quick to confess that he’s only ever had two real passions in life; art and bikes. Whilst working a semi corporate job through his 20’s, on the side Tony spent several years honing his creative skills with an airbrush and various other medias, painting friends and work colleagues’ bikes, and then before he knew it several of his creations gained massive recognition right around the world. It was at that point that Tony made the decision to go full time and launch his own custom bike painting business ‘Made Rad’ (check out his website, its dope!) Tony and Bryn first crossed paths a few years ago and they’ve been kicking around the idea of collaborating on a project together ever since… Read on to hear the tale about how ‘the snake bike’ came to be. I always thought that the downtube of the Norco Range already look’s a lot like a snake, and I knew if the vision of this concept was executed well it would could be incredible. Sometimes when I’m riding, attacking a section of trail, I like to try ride a little bit like a snake too; smooth, efficient and slingin’ it around the turns. Aside from that, the Red Belly Black Snake is just cool creature that I’ve always liked. I’ve come across a bunch of ’em over the years riding back in Oz and they seem to be really calm and not bothered by much. [R]: Mate you’ve crafted some insane paint jobs in the past for the likes of Ken Block and Troy Brosnan, but this snake bike is absolutely off the charts! I swear if you look closely at each tube of the frame you can actually see your blood, sweat and tears under the paint, eh? Tony: Haha, yeah I’m not one to cry about it, but there’s definitely some blood and sweat that went into that thing. It got pretty warm in the shop this summer and I sliced my thumb to pieces picking the tiny scale shapes out of the vinyl with an Xacto knife. [R]: In terms of the amount of detail and everything else, would you say this is the most ambitious project you’ve undertaken to date? Tony: This one is definitely up there in terms of the bike related projects that I’ve taken on. It’s not very often that I get the chance to flex the ol’ art muscle on something so hard and there were some unique challenges to work through to make it happen. [R]: Let’s go back to the very start of the story. When you launched your company, you moved up to Bellingham and opened your studio and that is where you met Bryn (a Bellingham local) and you boys started throwing ideas around about painting an epic bike. How many years ago was that and how did the conversation progress? Tony: I think we met through Paris Gore. He’s a mutual friend and fellow Bellingham local. The conversation about the paint job came soon after. At first, Bryn just quickly mentioned that he wanted to do a snake bike. Anytime we crossed paths after, the topic would come up with a little more detail would come out each time. I didn’t know it was actually going to happen until he called me last April or May and said that he had the frame ready to hand over. 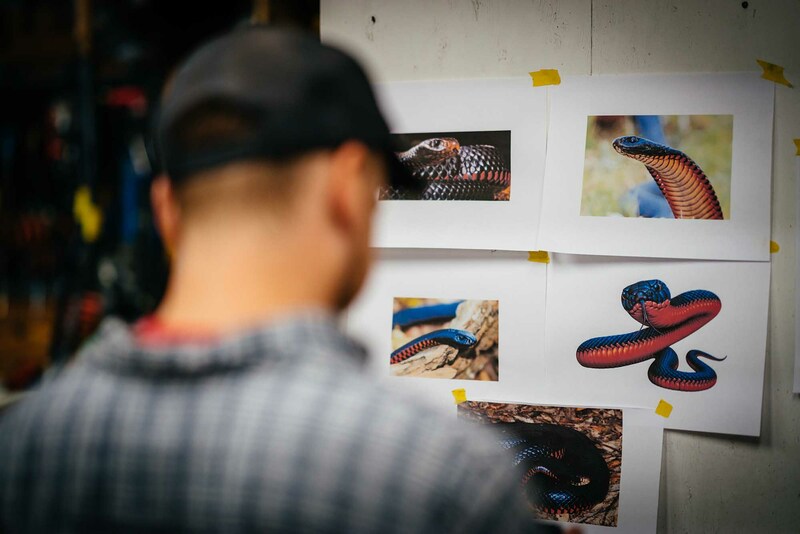 [R]: So then at that point do you guys just start researching photos of Red Belly Black snakes and try to figure out how the heck you’re going to transform the tubes of a bike into a reptile? Tony: Yeah, totally. I went over to his place to discussed the details and he already had some reference images and the frame laid on his kitchen table. We bounced ideas back and forth, but he pretty much knew exactly what he wanted and wouldn’t sway very far from his original vision. At that point, it was just up to me to try to figure out how to make it all happen. [R]: I’ll go on the record and state that I am glad you guys didn’t end up doing one, but I’ve got to ask, you guys didn’t opt for painting a big scary snake head on the bike anywhere. At any point were you discussing doing a head or was that never on the cards? Tony: Haha, that’s what everyone else would ask when they heard I was working on a snake bike. Bryn and I may have jokingly brought it up once or twice, but never any serious conversations about it. That would have put us on the fast track to cheesy-town for sure! [R]: So, okay let’s talk through the process of how you transformed a stock Norco Range frame into, well, a work of art. 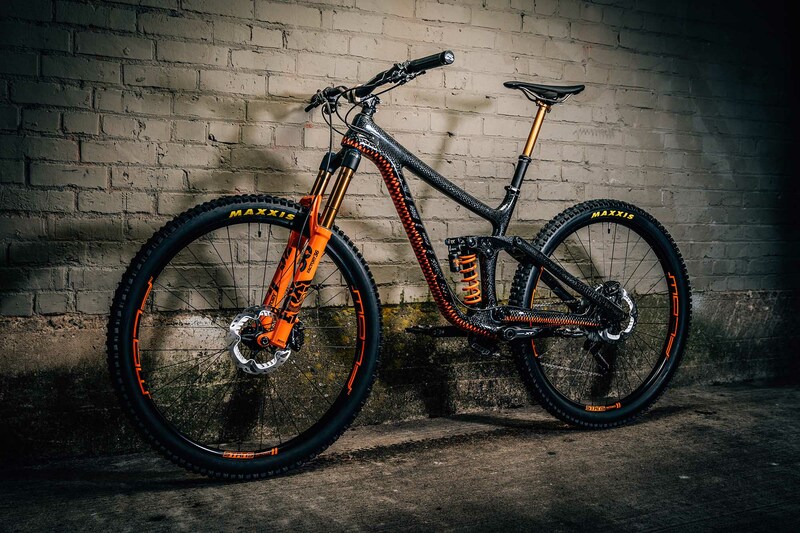 Was the carbon frame raw when you got it or did you have to strip it back? How does that work? Tony: It came to me with a stock paint job, so there was a lot of prep work to do before I could spray any paint. I always start by giving it a solid look-over. Checking for any imperfections in the factory paint and seeing how much work will be needed in order to level all of the stock logos and graphics. After I thoroughly clean and degrease it, I start sanding. It can take up to 3 hours to make sure everything is leveled and all of the nooks and crannies have been covered. Then comes primer and another round of scuffing before any fun can be had with the paint. [R]: Right, so then the real fun/pain must have begun. How the f*k did you manage to get each of those little scales on there. Was there a stencil involved? Tony: I hand drew a section of snake scales, then brought it into Illustrator where I cleaned it up and made the edges line up from one piece to the next. My thought was that I’d be able to cut different size sections on my vinyl cutter and fit them together as needed. After hours and hours of vinyl cutter work, I had to go back with an Xacto and pick out each rice-sized scale, leaving me with mesh-like vinyl puzzle pieces. I quickly realized that the shapes and curves of the Norco made nothing line up like my plan and made it much more difficult and time consuming than I had hope for. Once I finally had the entire thing covered, I tried to keep in mind how light would naturally hit the tube shapes. I then went in and added highlights and shading with my airbrush to each individual scale. It’s a privilege when you can sit in and watch a master conduct their craft, Tony’s skill is incredible. The snake bike took intense focus, colour and shading awareness to make it come to life the way it did. His workflow is epic too, pulling massive days and playing it “nothing else matters but this right now”. I think you have to be like that if you want to create something special. To see it in the flesh is stunning, it truly is a piece of art, a trophy. [R]: I know Bryn wanted to keep the snake scale/size of the scales as close to that of a real snake as possible, which means they’re pretty damn small. Surely you must have been keen to blow them up in size so that there were less of them and they’d maybe be easier to wrap around the frame? Tony: Yeah, I was trying everything could to figure out how to avoid covering the entire thing in those tiny scales knowing how much time it was going to take. My original suggestion was to blow them up a bit which would allow me to add some pretty heavy detail into each one. He squashed that one pretty quickly. Then I thought maybe we could do all of the tube junctions dark and have the scales fade in once the shape became a little more manageable. He noped that idea with little thought. [R]: One of the coolest details about the scales is that they’re not all identical and in fact the tubes of the frame really do have the appearance of the snake’s creases as if it is sliding along. How did you manage to achieve that? Tony: After looking at 100s snake references it became pretty clear to me that they have little inconsistencies and to not include them would have lost the realness a bit. It was the combo of playing with the frame shapes, the scale pattern, and the highlight/shadows that made it all come together. [R]: You must have lost count of the number of hours you put into this project, but if you had to take a guess what kind of number would we be talking? Tony: I started out trying to keep track of my time on this one, but as the days turned to nights and nights to mornings I lost track. I would say it was somewhere between 80 – 90 hours before I called it finished. [R]: When we were chatting the other day I asked if the bike is rideable, as in if the paint work will be durable enough for trail wear and tear, eh? Tony: Oh, for sure. I tend to go a little overboard with the clear coat because it adds more depth and durability. It would probably still chip or scratch if it was slammed by a rock or something, but it’s as durable as any other paint out there. Tony: Haha. It might make me cringe a little, but I wouldn’t hit ya. Just give me a little more time to recover.